Not sure if it's too early for this thread or if something already exists but mods can decide. 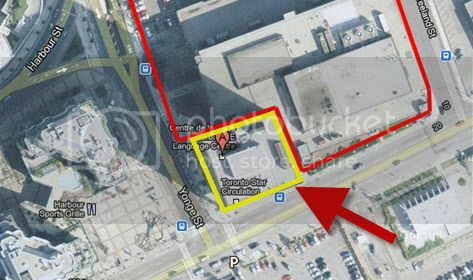 Description: Proposal to sever north portion of parking lot (to remain vacant until future development) and convert 3 sty portion of existing building on north side from Canada Post Storage Area to parking for existing building. This is a large plot of land. Plot in question? This site usually serves for parking during events. With all the development, I'm wondering where people will eventually park in the city. I guess that's a good thing - less cars, more transit. To me, the most interesting part of that app. is that the parking lot will remain vacant until future development. I'm guessing that's not too far off, otherwise they'd lose a ton of $ in parking income. Doesn't Pinnacle International own that land. Great location for an iconic supertall. With the address of "One Yonge Street" I really hope this becomes an iconic landmark and not just some run-of-the-mill office building or condo. If Pinnacle owns the land, I wouldn't hold out hope for anything more than medicore architecture. My girlfriend lives at 18 Harbour, which has a pretty huge public parking garage under the whole complex (which includes the other Yonge-facing buildings and 33 bay). During Leafs games and concerts, I find the P1 and P2 public parking levels are not completely full as it stands. And during the day, the office customers do not fill up the garage either. So I think there's still enough parking around there (not to mention if any of the other developments on Harbour street add public parking. I think parking will always be available. This definitely intrigues me. This can have a significant impact on both the Waterfront and the 'south of the tracks' area of downtown. I don't think we'll see something quite as big as Aura here, maybe something in the height range of Maple Leaf Square or Ice. This also has the potential to be a very prominent building when viewed from the Gardiner, much like the buildings on the west side of Humber bay (I forget what they're called, the big brown ones with black windows). Those were kind of a waste of a prominent sightline location. A waste? Place Pier and Palace Place are beautiful buildings, and are definitely worthy of their location. Does anyone have info on the property? I was trying to determine the size of the site and whether or not it had become part of the larger block behind the Star building. I find it so incredibly depressing to see an aerial view like that shows how many parking lots we have at such a prominent place in our city. Honestly, remove the street names and you could mistake it for Hamilton, not Toronto at the foot of Yonge between our CBD and the waterfront. Cheer up Xray ... Its a whole lot of opportunity and potential. Let's just hope its not squandered. I don't know, the brown on black doesn't really work for me. It's just a matter of personal taste though. They certainly are better than a glass box though. My point was more that this site is a pretty unique sightline for a lot of people entering the downtown area, so it's a chance to do something really unique and eye-catching.